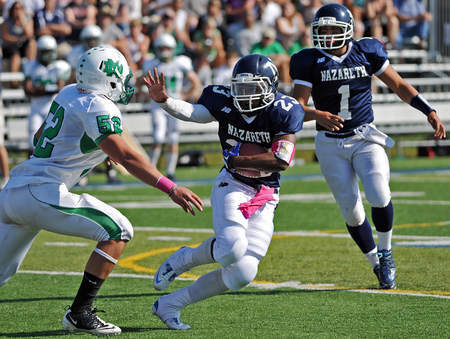 Class 6A Playoff Mini-Previews: How Long Will Nazareth’s Dream Season Continue? Nazareth, co-champions of the tough East Suburban Catholic Conference, enters the playoffs on a seven game winning streak. The Roadrunners, appropriately, are a run-first team. 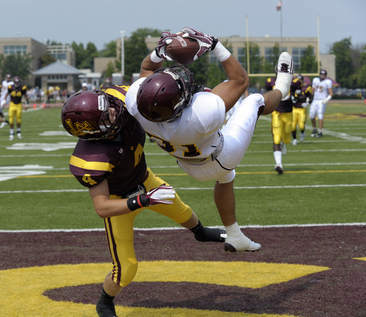 Running back Rudy Romagnano was the team’s workhorse to begin the season, but the senior suffered an ankle injury on the first play of Nazareth’s monumental victory over Joliet Catholic. Joshua Moore has taken over the full share of the load in Romagnano’s absence, and the Roadrunners haven’t missed a beat. Moore rushed for 136 yards and three touchdowns last week in the Roadrunners’ lopsided win over St. Viator. Defensive back Kalium Ewing returned two interceptions for touchdowns last week. It was the second time this season Ewing has done that, having also returned two picks for scores against Notre Dame. Ewing is an all-around playmaker, he has also reached the end zone on offense and special teams. Nazareth is definitely a threat to win the 6A title, but they face a challenging route to Champaign. 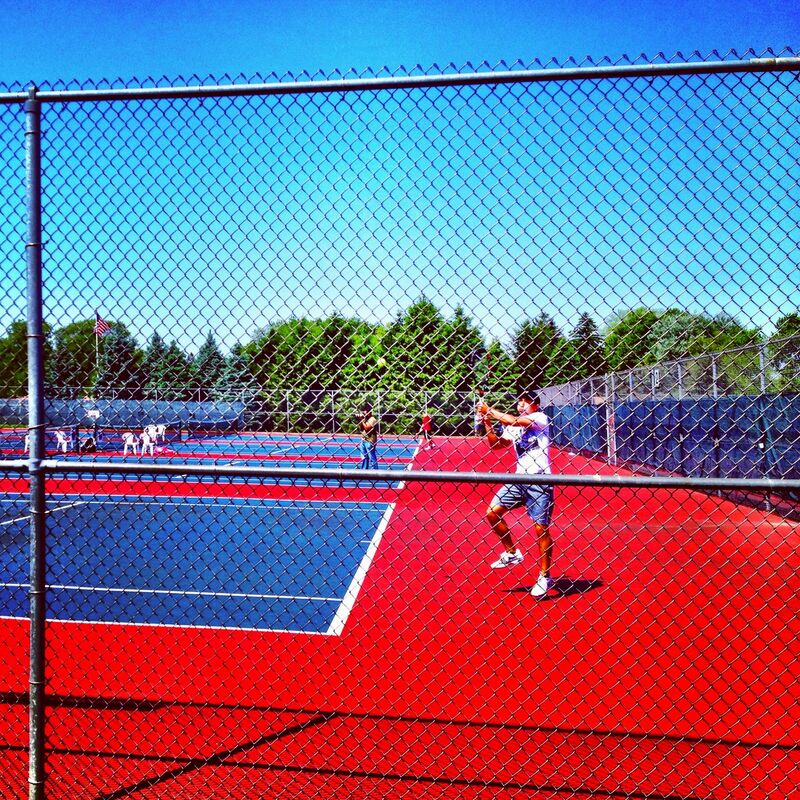 The Roadrunners will likely have to beat 2009 champion Cary-Grove in the second round (fresh off a win over previously unbeaten Prairie Ridge) and 8-1 Prairie Ridge in the quarters before meeting 9-0 Bartlett in the semifinals. #14 Deerfield will also pose a threat to the Roadrunners. Deerfield wrapped up a Central Suburban North championship last week with a 45-21 victory over Highland Park. The Warriors started out the season with three straight non-conference losses, but were able to finish the season with a perfect conference run of five straight wins. Deerfield also features a run-first offense. 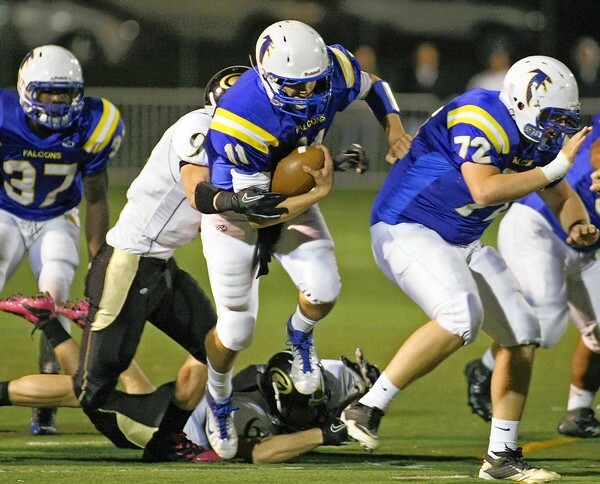 The Warriors rushed for 478 yards in their victory over Highland Park. Fullback Tyler Vajdic led the way with 185 yards and two touchdowns while wingbacks Mark Pagano and Ryan Adkins ran for a combined 206 yards and three touchdowns. Deerfield’s win over Highland Park (5-4) was the Warriors’ only victory over a team with a winning record. 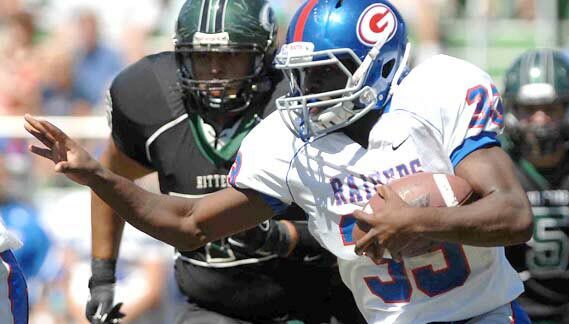 Glenbard South RB Wesley Sanders has made big plays for the Raiders all season long. Glenbard South, champions of the Metro Suburban Conference, are led by big play machine Wesley Sanders. The senior running back, who has reached the end zone over 20 times this year, leads an offense that has been running on all cylinders during the Raiders five game winning streak. Sanders had 159 yards rushing and three touchdowns in the Raiders’ conference-championship clinching victory over Ridgewood in week eight. Sanders has also had big plays as a receiver and returner this year. The Raiders’ three losses all came at the hands of playoff teams, including 9-0 Crete-Monee and 8-1 Prairie Ridge. The Raiders knock off Foreman this week, they will likely have a second-round rematch against Prairie Ridge. The Raiders will travel to Chicago to face Foreman, the champions of the Chicago Public School’s Big Shoulders Conference. Foreman also comes into the playoffs red-hot, winning their last six games of the regular season. Marmion made the 6A championship game last season but the Cadets just squeaked into the playoffs this year with a 5-4 record, albeit against a challenging schedule. The Cadets’ four losses came to playoff teams that combined to lose just four games all season (Marian, Montini, Batavia and St. Francis). The Cadets have a bruising defense and like to control the game with their bruising running attack led by Kyle Kozak, Garret Becker and Cody Snodgrass. Prairie Ridge cruised through the first eight games of the season, winning every game by at least three touchdowns, before dropping their regular season finale against Cary-Grove, 22-21 in OT. The Wolves outscored opponents 381 to 87 this season. The Wolves, angry and motivated after losing their first game, will likely be too much for the Cadets. 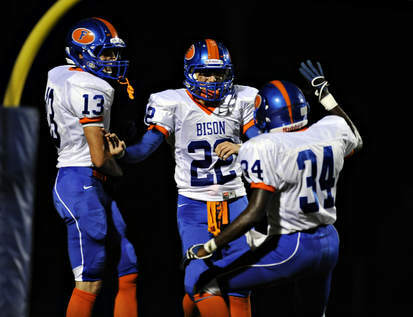 Fenton RB Alan Geneva celebrates with teammates after a touchdown. First off, I’m really not sure how Fenton received a higher seed than Glenbard South. Yes, I know the Bison have a better record, but the two conference foes played just three weeks ago, and the Raiders won in convincing fashion 40-8. 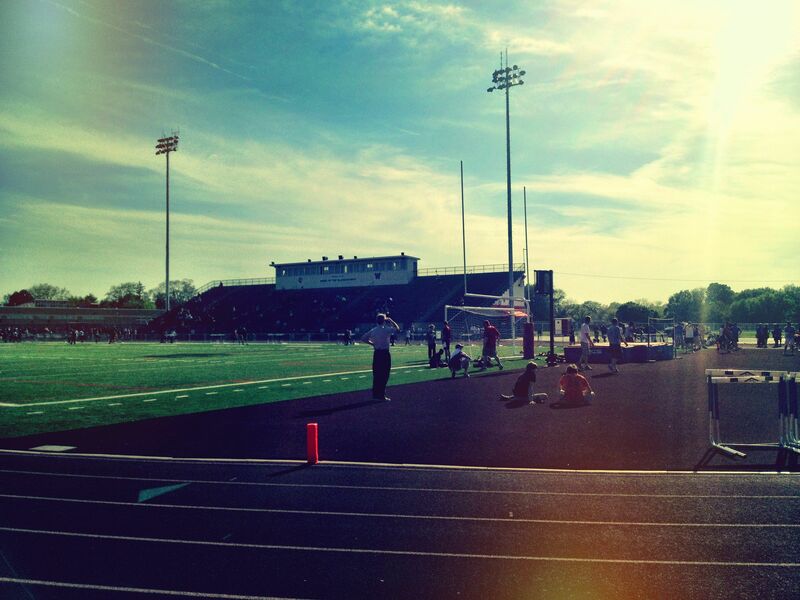 Fenton complied a pretty empty 7-2 record, winning zero games against playoff teams. In fact, the Raiders were the only playoff team they faced, and as I just said, they lost by 32. Anyway, the Bison are led by running back Alan Geneva, who does most of his damage catching screen passes. Fenton runs an interesting offense that features a lot of screen passes out of a shotgun formation. Lake Forest won a share of the North Suburban Lake division this season. The Scouts are led by running back Owen Williams who ran for 233 yards and three touchdowns in last week’s victory over Libertyville. The Cadets season got off to a rough start with a 36-7 beating at Batavia on Aug. 26. Marmion had an awful first half, turning the ball over six times on their way to a 30-0 halftime deficit. The Cadets had an incredibly difficult time throwing the ball. They had four different players attempt a pass, and combined their pass-throwers completed as many passes to fellow Cadets as they did to the defense (four). 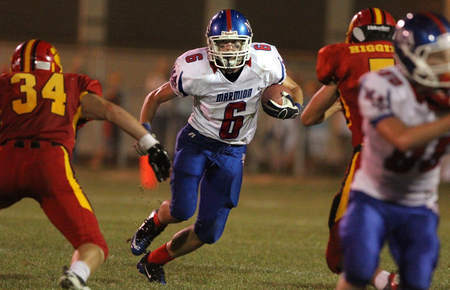 Marmion’s lone score came on a 77-yard run by running back Garret Becker after the game had already been decided. The Cadets recovered from their week one beating with a 6-0 win in a defensive grinder with Fenwick. 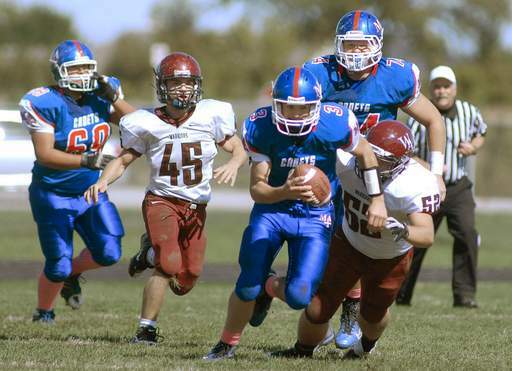 Once again, the Marmion offense struggled, scoring only one touchdown. However, the 6-yard run by running back Kyle Kozak was all the Cadets needed. The Cadet defense came out strong to start the game, allowing Fenwick to gain only two total yards and no first downs in the first half. Marmion held the ball for 19 of the game’s first 24 minutes. The Cadets held on in the second half, stopping a couple of long Fenwick drives before the Friars could reach the end zone. 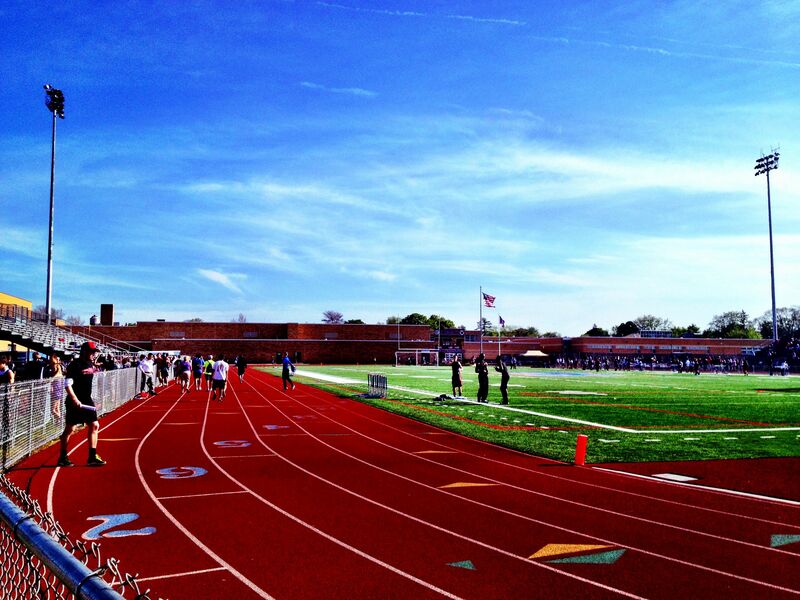 Marmion ran 47 plays to Fenwick’s 31, and out-gained the Friars 165 yards to 59 yards. Montini, the two time defending Class 5A champions, did more than hold their own against Class 8A, defeating the Pirates 26-21 in Lombard on Aug. 26. Running back Dimitri Jones ran for 160 yards and two touchdowns on 15 carries, stealing some of the spotlight from usual Bronco star wide receiver Jordan Westerkamp. The Nebraska-bound Westerkamp did have a solid game, catching 5 passes for 88 yards and a touchdown. Quarterback Mark Gorogianis, filling in for the injured John Rhode (fractured right thumb, expected to miss three more weeks) was 13-for-24 for 134 yards, one touchdown and 3 interceptions. Westerkamp had an outstanding performance, but it wasn’t enough to beat Malcolm Weaver and Loyola, as the Broncos lost 41-24 to the Ramblers. The 6-1, 200 lb. Westerkamp was double covered on nearly every play but still collected 7 catches for 135 yards and three touchdowns. However, the Broncos could not stop Ramblers quarterback Weaver, who was 21-for-29 for 246 yards and 5 touchdowns. Weaver also had 100 yards rushing and one touchdown on 15 carries. Gorogianis improved his play, completing 16 of his 29 passes for 275 yards, three touchdowns, and perhaps most importantly, no interceptions. Marmion has to do two things if they have any chance of knocking off Montini Friday night, and neither will be easy. First, the Cadets must improve their offense which has only produced six total points through two games. They were able to control the time of possession last week against Fenwick, which was a step in the right direction, but they only found the end zone once. Secondly, Marmion has to contain Jordan Westerkamp, which is much easier said than done. With their meager offense, the Cadets can’t afford Westerkamp to go off like he did last week against Loyola (7 recs, 135 yds, 3 TDs). The Cadets don’t have a playmaker like Loyola’s Malcolm Weaver to offset Westerkamp’s production. It will also be interesting to see the progression of Broncos quarterback Mark Gorogianis, now in his third week filling in for injured QB John Rhode. Gorogianis improved greatly from week one to week two, will his improvement continue in week three as the Broncos enter conference play?